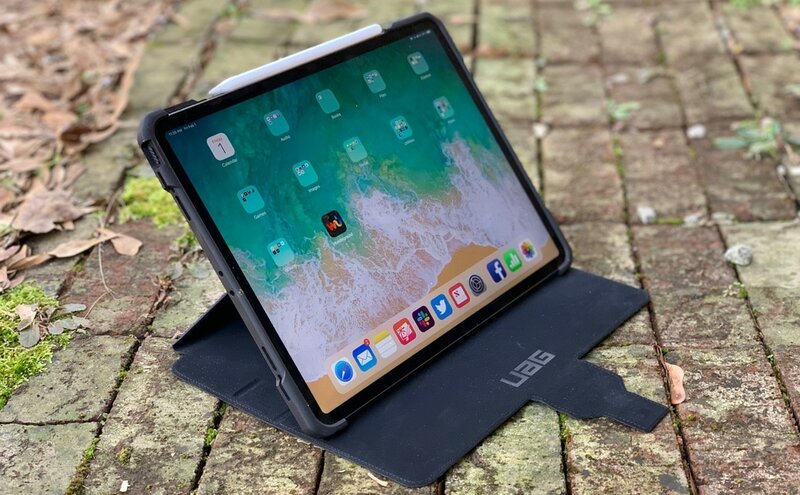 The UAG Metropolis was created for those who want additional protection for their iPad Pro without taking on too much extra weight. The tablet’s front and back are completely covered, and the corners are given extra-thick bumpers. This Urban Armor Gear case meets the military drop-test standard (MIL STD 810G-516.6). This means UAG repeatedly dropped the case from a distance of 4 feet onto 2 inches of plywood over concrete without it suffering damage. The test requires dropping the case 26 times: six times on its face, eight times on the corners, and 12 times on the edges. But it can do little about liquids. The Metropolis has openings for the tablet’s ports, buttons, cameras and more. It’ll help out some on light rain but be very careful around bodies of water. There is no built-in screen protector, as is included in the more-expensive OtterBox iPad cases. The UAG Metropolis is designed to be hard to drop. We tested the UAG Metropolis for the newest 12.9-inch iPad Pro. It weighs 1.2 pounds, so it’s close to the weight of the tablet itself (which comes in at 1.4 pounds). The additional bumpers add less than half an inch to the length and width of the iPad Pro, and the combination is only about 0.6 inches thick. So this UAG folio case is relatively lightweight for a rugged offering, but some additional bulk is inescapable. The increase in size is almost negligible. The exterior offers numerous ridges to make it easier to hold on to. A side effect is an industrial look that’s undoubtedly cool but doesn’t seem quite right for a board room. UAG offers the Metropolis in black, magma (red) and cobalt (blue). The cover can fold around the back to be out of the way, of course, but it can also serve as a stand. Better yet, the UAG Metropolis can hold the iPad up at several different angles. One option is with the cover flipped down and under to serve as a base. Notches in the back of the cover support the tablet at 130 degrees or 110 degrees. The iPad is fairly stable in that latter configuration, even when being held in one’s lap. That said, there are no magnets securing the edge of the tablet in the notches that hold it up, so it doesn’t take much jostling for it to flop flat. This is one of the ways the UAG Metropolis can serve as a stand for the iPad Pro. But wait — the Metropolis has another trick.The cover can be folded into a triangle behind the tablet to hold it up at 120 degrees. This configuration is more likely to tip over, but it takes up less room. The new Apple Pencil must physically touch one edge of a 2018 iPad Pro to charge. The UAG Metropolis is open on that edge to allow this. Even better, there’s a curved plastic tab there to bring some additional support. It doesn’t fully wrap around the stylus, but the tab attached to the cover to hold the case closed does. We never had the Pencil come loose in our weeks of testing. The downside of this plastic tab is that it’s useless to people who aren’t planning on getting an Apple Pencil. It won’t hold a pen, for example. There’s also a version of this case for the long-discontinued 9.7-inch iPad Pro. That tablet uses the original version of the Apple Pencil, so the case for it has a different holder. Carrying an iPad Pro around without a case is somewhere between foolish and crazy. The UAG Metropolis brings real protection, if not to the level you’d probably need if you planned to take your tablet on a three-day hike. And it does so while keeping the iPad very portable. 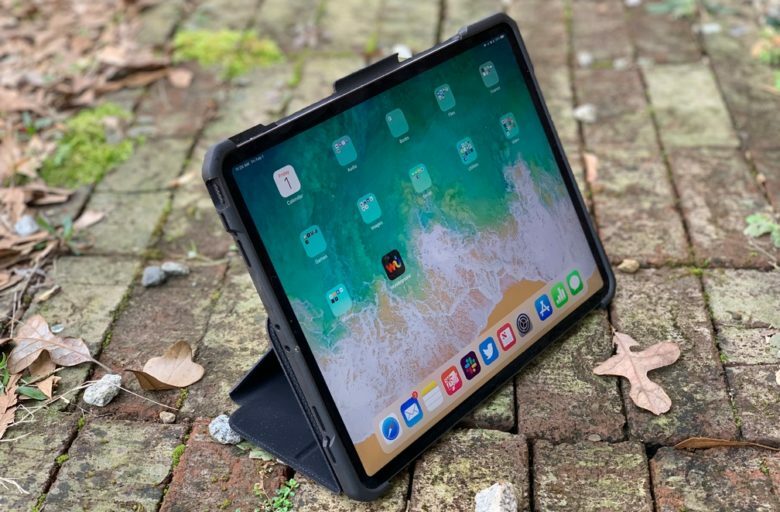 The version we tested for the third-generation 12.9-inch iPad Pro costs $89.95. The one for the 11-inch iPad Pro runs $59.95. For comparison, the OtterBox Defender for the larger Apple tablet retails for $129.95, so the UAG offering is cheaper, if not as full featured. Urban Armor Gear provided Cult of Mac with a review unit for this article. See our reviews policy, and check out more stuff we recommend.